Posted by Charlotte on November 14, 2009 at 7:04 pm. Last week Paste declared their 25 Documentaries of the Decade. To be honest it was a bit of a disappointingly obvious list, in terms of safely including most of the biggest docs of the decade. Every film on their list is a great documentary but there were also a great amount of other films that possibly should have seen a mention. I tried to limit to 25 but it’s just impossible. This isn’t necessarily in any order, I hate the idea of saying one is better than the other, especially when you’re talking 10 years of filmmaking and also the sheer spread of importance and subject matter, feel free to call me a wimp. THE THIN BLUE LINE! A Documentary that exonerated a man! Oh, “of the decade”. My bad. I LOVE Standard Operating Procedure but thought I’d limit myself to one Errol Morris, likewise Werner Herzog and Encounters at the End of the World. Also realised I’d wished I’d managed to include Party Monster. So many to choose from. nice list charlotte. but, from brazil, you must see also eduardo coutinho’s “edificio master” (2002) e “jogo de cena” (2007) – http://tinyurl.com/ylqp3yv. joão moreira salles’ “nelson freire” (2003) e “santiago” (2007) – http://tinyurl.com/yapl559. and “estamira” (2004), directed by marcos prado (producer from “bus 174″) – http://tinyurl.com/yd54d9v. finally, ” pessoa é para o que nasce” (2003), by roberto berliner. – http://tinyurl.com/yffkad2. Darwin’s Nightmare (Sauper, 2004). Beautifully shot, compassionate, intellectually rigorous. It’s a good list, with quite a few I haven’t seen. I’m surprised to ‘Lake of Fire’, ‘Enron: The Smartest Guys in the Room’ and ‘The White Diamond’ absent from the selection, although I’m very glad that none of Michael Moore’s efforts made the cut. I’d also like to take this opportunity to recommend a documentary called ‘Mugabe and the White African’, which hasn’t received much in the way of proper distribution yet, but it’s certainly a contender for my own best of the decade list. Phil: Mugabe and the White African is amazing, trying to organise a London screening at the moment. Enron was a really close call, as was The White Diamond. Could’ve made the list twice as long but I’d pushed it with 50 as it is. Missing: The Betrayal (Nerakhoon) and Darwin’s Nightmare. Some great recent Canadian docs: 65_RedRoses, Waterlife, RiP! : A Re-Mix Manifesto; and an older Canadian doc that still stands the test of time: The Corporation. Can’t thank you enough for the compilation. Some of them are really “out there”. Have only seen the Oscar-spotlit ones. WIll sure be on a lookout for some on the list. The content here is very helpful. Of course, I’ve updated it. Mugabe and the White African is a great film in my books combining a gripping story with masterful story telling. The filmmakers made their craft look deceptively easy because they captured every crucial event in that story, and yet the making of the film was a nightmare. They never spent more than three days at a time on location; they shipped their gear separately. They could have been killed had they been caught; their subjects were beaten nearly to death part way through. They risked their lives to make that film, and also managed to make it complete, artistically coherent, rigorous, elegant. I would call for a more rigorous list, and refine this one to films that are both great stories AND show great story telling. I think Etre and Avoir is a sublime film. I too would add The Corporation. The English Patient is in the running. a little Israeli film called The Beetle was loaded with grace. Southern Comfort (2001) remains an unforgettable documentary film for me. When I compiled the list I hadn’t seen Mugabe and the White African. I have now and completely agree. I recently interviewed the filmmaker’s for a British magazine and it’s just incredible even hearing how they got the footage out of Zimbabwe, let alone the other difficulties making the film. I’m also screening the film in London on the 31st January. As far as The Corporation, I really enjoyed it, and it’s an outstanding film, it just didn’t make the list. I haven’t seen The Beetle so will definitely check that out. What I don’t have an understanding of is how you are not even more well-liked than that you are now. You are just so intelligent. You know so considerably about this subject, made me feel about it from so many distinct angles. Its like persons arent interested unless it has some thing to complete with Lady Gaga! Your stuffs fantastic. Keep it up! Welcome to In One Eye, Out the Other! My name is Charlotte and this is my blog for anything and everything that I love/like and an ongoing portfolio of my work. I'm 26 and have spent 20 of those years in education, studying a large range of things from Media Technology to Graphic Design, Photography, Motion Graphics, Web Design, New Media and most recently an MA in Documentary. I'm a filmmaker and photographer and I watch, write about and programme documentaries. 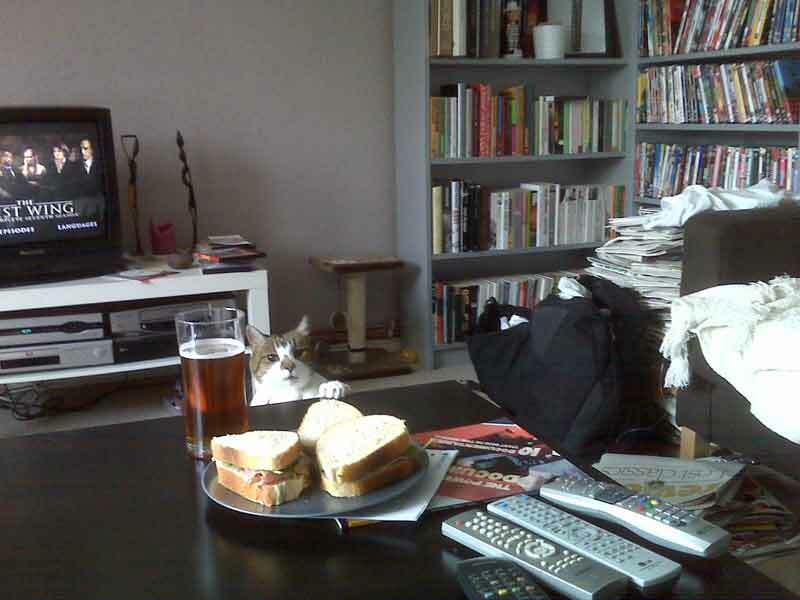 I live in London with a very large old cat, Henry, who is quite partial to ham sandwiches. © In One Eye, Out The Other. All rights reserved.